What becomes of your old jeans after you finally retire them? We use our old blue jeans to make a fine quality handmade denim paper. We first remove the zippers and rivets and pulp up the denim fabric fibers. We then blend the blue jean pulp with post-consumer pulp and carefully hand make each sheet of denim paper in our San Diego facility. The denim paper is just like the light blue color of your favorite pair of faded jeans. Small bits of the denim fibers are visible in the paper. 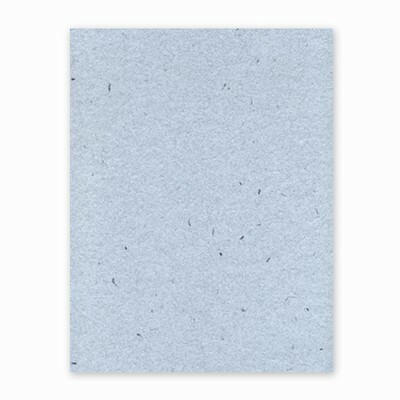 The denim paper can be used to make note cards, business cards, handouts, and mailers. We offer a packaged PaperEvolution® denim paper note card set includes five A2 sized cards and vellum envelopes. Green Field Paper is your source for all your denim paper products! This handmade paper is crafted one sheet at a time and made with recycled blue jeans. We used denim blue jeans and added it to our post consumer pulp to bring you this this paper. People have used it for business cards, note cards and invitations and it is used in our Denim Note Sets. This paper does not contain seeds. We are offering the sheets trimmed to 8.5 x 11 inches without the deckle edge in a package of 10 for $21.95.